This isn’t just any strawberry pavlova, this one is topped with a sticky strawberry glaze and drizzled with caramel for a fancy finish. Preheat the oven to 140C/280F/Gas 1. Line a baking tray with parchment paper. 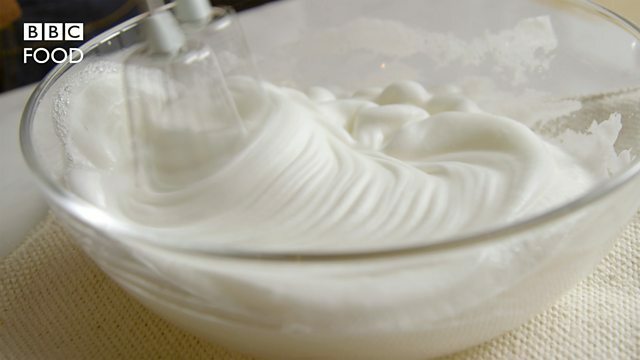 For the meringue, place the egg whites into a large food processor with a whisk attachment, and whisk until soft peaks are formed when the whisk is removed from the bowl. Gradually add the sugar and whisk until firm. Gently fold in the cornflour and vinegar. Spoon the meringue onto the baking tray to make a large nest shape. Place in the oven for 10 minutes and then turn down the heat in the oven to 120C/250F/Gas mark ¼ and cook for one hour. Then leave overnight in the oven to cool completely. For the strawberry, white chocolate and vanilla cream filling, paint the melted chocolate inside the nest of the cooled pavlova. Place the cream and vanilla seeds into a large bowl and whisk until soft peaks form when the whisk is removed from the bowl. Add the halved strawberries and mix thoroughly. Spoon this mixture over the white chocolate-coated meringue. Place the whole strawberries on top. For the strawberry glaze, place the strawberries into a food processor and blend. Pass through a fine sieve and place in medium frying pan over a medium heat. Drain the gelatine leaves and squeeze any excess water out, then add the gelatine to the pan and stir to melt into the strawberry sauce. Brush the whole strawberries with the strawberry glaze. To serve, place the caster sugar in a frying pan and heat until melted and golden-brown. Drizzle the caramel over the pavlova.